SFP (Small Form-Factor Pluggable) transceiver is a hot swappable I/O device that plugs into a Gigabit Ethernet port or slot, linking the port with the network. Gigabit Ethernet SFP transceivers are designed to use with Gigabit networks. They are compliant to IEEE 802.3 standards and with different types to fit for 1000Base SX, LX/LH, EX and 1000Base-T applications. It is important to choose a proper Gigabit Ethernet transceiver to act as an interface between the device and the cable. The interconnecting cable can be made of copper or fiber optic. This choice of transceiver is usually made based on the type of fiber optic cable. Cisco Gigabit Ethernet SFP Transceiver Modules mainly include 1000BASE-T (or GLC-T) SFP, 1000BASE-SX SFP, 1000BASE-LX/LH SFP, 1000BASE-EX SFP, 1000BASE-ZX SFP, 1000BASE-BX10-D and 1000BASE-BX10-U SFP. 1000BASE-T (or GLC-T) SFP: Cisco GLC-T is a copper wire SFP for 1000Base-T applications. The 1000BASE-T SFP operates on standard Category 5 unshielded twisted pair copper cabling of up to 100m length. Cisco 1000BASE-T SFP module supports 10/100/1000 auto-negotiation and Auto MDI/MDIX. 1000BASE-SX SFP: 1000Base-SX SFP supports Multimode fiber only. It operates on 50μm multimode fiber links up to 550m, up to 1km over laser-optimized 50μm multimode fiber cable and on 62.5μm Fiber Distributed Data Interface (FDDI)-grade multimode fibers up to 220m. 1000BASE-LX/LH SFP: 1000BASE-LX supports both Multimode and Single-mode fibers. 1000BASE-LX/LH SFP operates on standard single-mode fiber optic link spans of up to 10km and up to 550m on any multimode fibers. 1000BASE-EX SFP: The 1000BASE-EX SFP supports for Single-Mode Fibers. 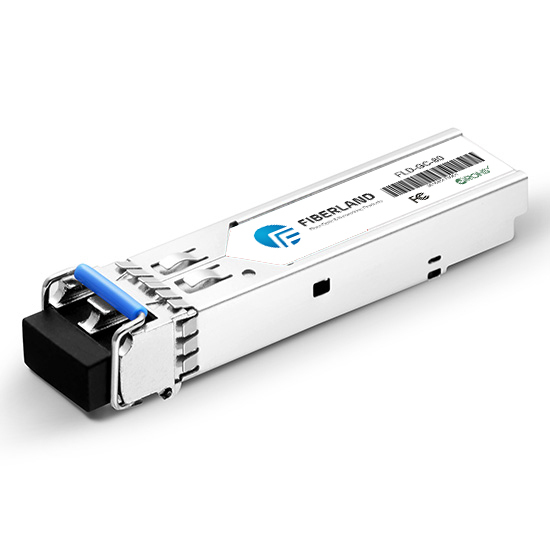 1000BASE-EX SFP operates on standard single-mode fiber-optic link length up to 40 km. A 5-dB inline optical attenuator should be inserted between the fiber-optic cable and the receiving port on the SFP at each end of the link for back-to-back connectivity. 1000BASE-ZX SFP: The 1000BASE-ZX SFP operates on standard single-mode fiber-optic link spans of up to approximately 70 km in length. The SFP provides an optical link budget of 23 dB, but the precise link span length depends on multiple factors such as fiber quality, number of splices, and connectors. 1000BASE-BX10-D and 1000BASE-BX10-U SFP: The 1000BASE-BX-D & 1000BASE-BX-U SFPs used for Single-Fiber Bidirectional applications. A 1000BASE-BX10-D device is always connected to a 1000BASE-BX10-U device with a single strand of standard SMF with an operating transmission range up to 10km. The communication over a single strand of fiber is achieved by separating the transmission wavelength of the two devices. 1000BASE-BX10-D transmits a 1490-nm channel and receives a 1310-nm signal, whereas 1000BASE-BX10-U transmits at a 1310nm wavelength and receives a 1490nm signal. Wavelength-division multiplexing (WDM) splitter integrated into the SFP to split the 1310nm and 1490nm light paths, up to 80km or 1000base BX-D BIDI tx1550 rx1490nm 80km in simple.